Wedding of Norman William Reid and Mavis Dawn Reid (known as Dawn) nee Logue b. 1930 in Auckland in 1951. 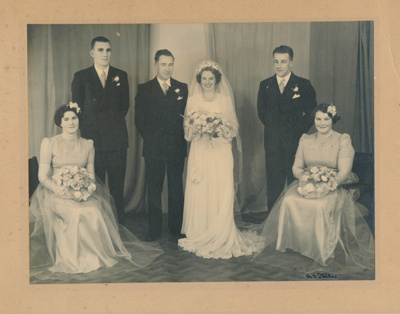 L-R: Kathleen Levet (bride's cousin), ?, Norman Reid, Dawn Logue, ?, Colleen Logue (bride's sister). Dawn's parents were John Loughlin Logue and Dorothy Marion Logue nee Underwood of Tomarata. The wedding dress has been gifted to the Museum. eHive number 15-113.